11. Consolida S.F. Gray, Natur. Arrangement Brit. Pl. 2:711. 1821. Boiss., Fl. Or. 1:75. 1867, pro sect., Huth in Engl., Bot. Jahrb. 20: 322-499. 1895, pro sect., Munz in J. Am. Arb. 48: 159-202. 1967. Annual plants with palmately laciniate leaves. Inflorescence racemose or paniculate. Pedicels in axils of bracts, each bearing usually 2 bracteoles. Flowers zygomorphic. Sepals 5, petaloid, the posterior one spurred. 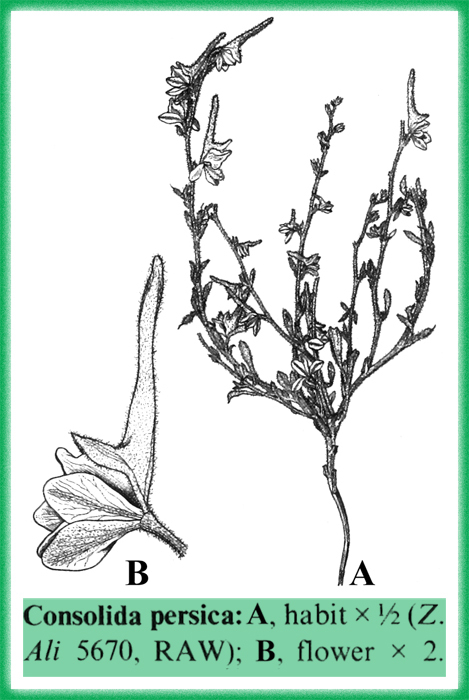 Petal 1, subentire to 3-5-lobed, (homologous to the fused superior petals of Delphinium). Stamens numerous. Carpels solitary, forming a follicle. Several species are cultivated for their ornamental value, and some are found as escapes. The genus comprises more than 40 species, which are distributed from the Western Mediterranean to C. Asia, wh ere they prefer arid to semi-arid regions. Several species are found as weeds in agricultural areas. Represented in Pakistan by 8 species. In the present account Munz’s (1967) treatment of the genus is followed. Consolida paradoxa (Bunge) Nevski = Consolida rugulosa (Boiss.) Schroed. Delphinium aucheri Boiss. = Consolida rugulosa (Boiss.) Schroed. Delphinium flavum DC. = Consolida flava (DC.) Schroed. Delphinium orientale Gay = Consolida orientalis (Gay) Schroed. Delphinium paradoxum Bunge = Consolida rugulosa (Boiss.) Schroed. Delphinium persicum Boiss. = Consolida persica (Boiss.) Schroed. Delphinium persicum var. aucheri (Boiss.) Boiss. = Consolida rugulosa (Boiss.) Schroed. Delphinium rugulosum Boiss. = Consolida rugulosa (Boiss.) Schroed.